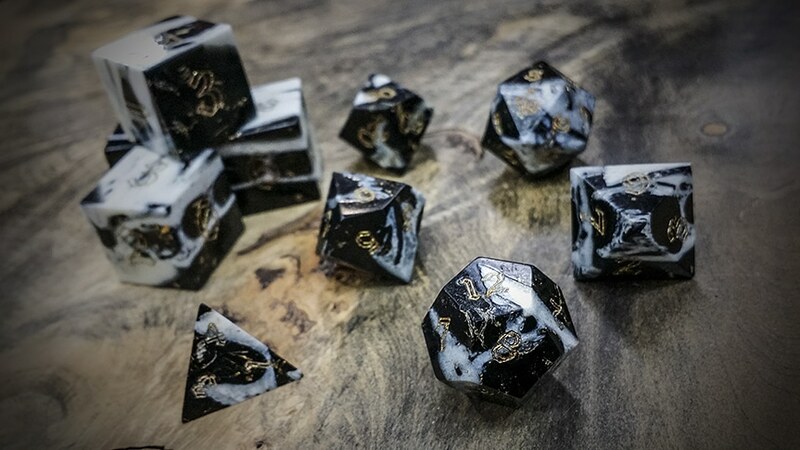 In 2014 we rolled out something special for GenCon, something we’d been asked to make since the very first day Artisan Dice existed. It’s the 2nd most commonly asked for item on our customers’ wish lists. Bone Dice. As it would turn out all those issues are solved once you stabilize the bone and cast it in a urethane resin block. The colored holes you see are the resin filling in the teeth holes in the gator jawbone. The white parts are the actual gator jawbone. Yup, these dice aren’t just crated from any old bone, they’re made from an actual alligator jaw bone fresh from the swamps of Lousiana. Actually, they come from an alligator farm in Louisiana where we source gator jawbones from the largest of farm raised gators as it takes an 8ft gator to have a large enough jawbone to craft our dice from. Much like carnivorous cows, these gators are raised for meat and leather. If you haven’t tried it, fried alligator tail is really delicious.